Used for coating cakes and for decorations such as run outs, extensions etc. and for piping purposes, royal icing is a most versatile of icings. Plenty of practice is recommended but once you have mastered the technique you will be hooked! Fresh egg whites are generally not used now so pure dried albumen or a substitute such as Meri white are used instead. Pure albumen powder makes a stronger icing and is more suitable for run-out sugar work, extension work and fine piping. However the addition of glycerine will soften it if necessary for other uses. Meri white results in a softer, slightly whiter icing for covering cakes (and also making meringues) and tends to be cheaper to buy. It is essential that all equipment and utensils used are clean and free from grease. Any spots of grease will result in a heavy icing, therefore difficult to work with. You are aiming for a light, bubble free icing (soft peaks). The use of good quality or bridal icing sugar should eliminate the need for sieving. After use, when storing, place any leftover icing in a clean bowl. This eliminates the danger of any dried out bits on the side of the bowl falling into the icing! Keep the icing covered with a damp cloth whilst working with it to prevent drying out. Do not keep the cloth over for too long as it will cause the icing to absorb the moisture from the cloth and change the consistency. Add a little piping gel to royal icing for brush embroidery work - it delays the setting time ! Leave icing in a piping bag to dry out completely, then grate to achieve a snow effect to add to your snowscene ! If making in a mixer, use slowest speed and take care not to over beat. This could cause air pockets in the icing which cause problems when trying to coat or pipe. Different consistencies of icing are required for different purposes so the icing, once made, will probably need slightly adjusting. Before use, whether for piping or coating, ‘paddle’ it with a palette knife to eliminate all the air bubbles. 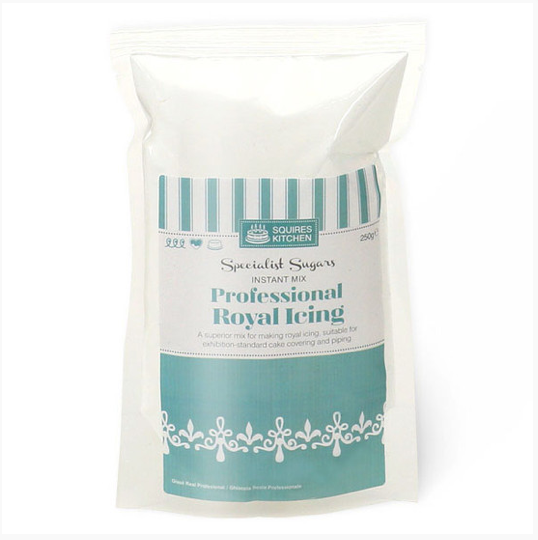 This achieves a smooth icing suitable for coating cakes. If a firmer icing is required where it has to hold its shape e.g. for piped flowers, you will need to add a little extra icing sugar to the basic mix. For run outs (letters/numbers, collars etc.) paddle to eliminate any air bubbles, and add more water as necessary to achieve a flowing consistency. NOTE! Do not add glycerine to a run out icing as this will soften it too much. A stronger icing is needed for this type of work. When coating a cake you will find that a turntable is useful especially when icing the sides. You can turn the cake around and achieve a good smooth edge. Do place cake on work surface when icing top, as you do not want cake moving as you draw the icing across the top of the cake. A good strong straight icing ruler is essential for smoothing the top of the cake. Palette knives are useful – a small one for putting the icing onto the sides, and a large one for spreading onto the top. Ensure cake has straight, squared off edges (as opposed to rounded for sugarpasted cakes). 3-4 thin coats are recommended, making each coat a little softer with a drop of extra water as you go. Sit the cake on a turntable and paddle the icing onto the side with a palette knife. (If a square cake, ice one side at a time). Using a side scraper, holding it at an angle towards you, pull it around the cake, starting as far back as possible, turning the cake with one hand and holding the scraper with the other. Coat the board using a palette knife, if wished, after completing the cake, while the icing on the cake is still fresh. Always use good quality tubes if possible. These are stainless steel and are seamless and will give the best finish. Any tubes with a seam may distort the piped design! Ensure tubes are washed out well after use and no icing is leftover inside tube.